The parish of Southampton has some of the best beaches in Bermuda – as well as the biggest concentration of them. 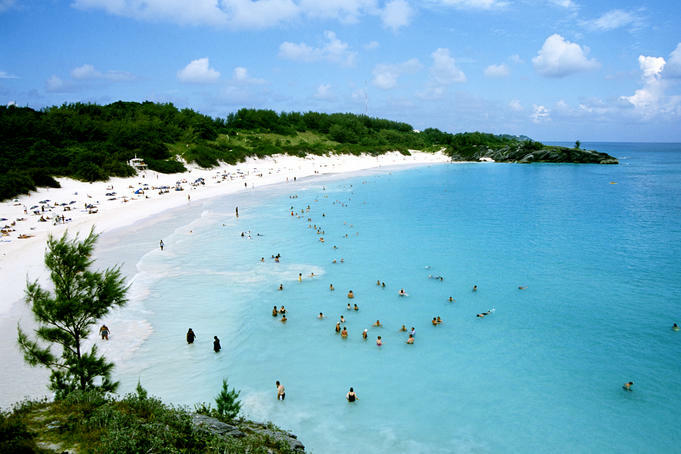 Amongst them is the famous Horseshoe Bay Beach in Bermuda (pictured), probably the busiest beach on the island. However, if you like a bit more peace and quiet, Wafer Rocks Beach is for you. There are a few smaller beaches on each side of Horseshoe Bay you can still enjoy the beautiful waters and scenery of this part of the island without the crowds and herds of tourists. Wafer Rocks Beach is one of the little coves that are scattered along the shores between Horseshoe Bay and Warwick Long Bay, in the parish of Warwick. Theses coves are usually quite empty because they are not very easy to access and they can be a bit far from any facilities. But if you are ready to take the walk to them, you’ll be rewarded with soft white sand, calm blue waters and a secluded place ideal for a romantic or relaxing time. Wafer Rocks beach is located on the east of Horseshoe Bay and the best way to reach it is to take one of the trails that leave from the beach and go onto the South Shore Park. There is one quite close from the sea that you’ll find by going around a grassy area on your right. Follow this trail for only a few metres until you reach a beach surrounded by grassy mounts and rocks. You can also walk from Horseshoe Bay to Wafer Rocks by wading along the ocean. Even though it is only a few metres from the busy and noisy Horseshoe Bay beach, Wafer Rocks is somehow isolated from it by the rocks that separate the beaches form each other. There are many advantages in being on Wafer Rocks: you have more space to spread your towels around and for the kids to play, there are a few rocks in the water and not too far away for those who want to snorkel, the waters are calm and the rocks that surround the beach stop some of the wind that can occasionally be fresh. You are never too far from the facilities of Horseshoe Bay so you don’t need to carry food or water, but you won’t be able to use any rented equipment that far from the concessions. Just at the back of the beach is the South Shore Park where you can find some picnic tables and nature trails. It is a great playground for children and it has trails that can take you further east up to Astwood Cove along the coast. Wafer Rocks Beach, Southampton – Part of Elbow Beach Cycles’ Things To Do in Bermuda series! Get on your bike to Wafer Rocks Beach, Southampton, in Bermuda! Rent a scooter, moped or bike from Elbow Beach Cycles and get a great 10% off your scooter hire if you book online NOW.